Modern caravans can provide self-sufficient accommodation ‘off-grid’ via an on-board 12-volt leisure battery, which will power lighting, heating, hot water and entertainment systems – but only for a limited period. Here’s what you need to know about how it all works and how to keep your battery in tip-top condition. While there is no danger of electrocution from a 12V circuit, the type of battery used for storing power for 12V equipment can provide, for short periods, a power output of several kilowatts. In the event of accidental misconnection, this output heats the wiring and can cause a serious fire hazard and risk of personal injury. If in any doubt about carrying out repairs or installations, consult a qualified electrical engineer. The battery you’ll find under the bonnet of your car is designed to supply a high current for a short period to start the car engine but it isn’t suitable for powering a touring caravan’s electric services. Leisure batteries are designed to supply currents of a few amps for longer periods and to be discharged and recharged many times. Battery life is enhanced if it is kept well-charged, so the use of a suitable charger is advisable if a mains hook-up is available. After a period of discharge, the battery should be recharged as soon as practical, being left in a discharged state will reduce its life. During prolonged periods of idleness, eg in winter, it should be given a top-up charge every six to eight weeks. In order to ensure that it is properly charged, but not over-charged, an 'automatic' or 'voltage controlled' battery charger specifically designed for leisure batteries should be used. When not in use, unless it is required to power a security device, disconnect the battery from the caravan, as many modern caravans contain devices which may draw a small but appreciable amount of power and which will, over time, flatten the battery. Avoid leaving a battery on charge for long periods over the winter, unless the charger is specifically designed with a ‘trickle charge’ facility. A water pump may take several amps, but it is usually only working for a few seconds at a time. Old style light bulbs, TVs and any appliances that produce heat such hair dryers will use a lot of power and drain the battery more quickly. Modern LED lights – especially for winter caravanning, when the lights are typically on for longer periods – can significantly reduce demand on the battery. The following table gives specimen figures for the consumption of typical appliances found in a caravan. While this is only one possible example, and your usage may vary significantly from this, it does suggest that a battery of 60Ah capacity is the minimum size required. TV 8.0 1 3 24. Battery size and weight increases with capacity - with a 70Ah size weighing typically about 19kg. Since this must be included as part of the caravan’s payload, a compromise between capacity and weight may be necessary. Battery capacity tends to diminish with age and usage so it pays to choose a high capacity battery with a good power-to-weight ratio. While charging, a battery may give off a small amount of gas and if overcharged, it could give off an explosive mixture of hydrogen and oxygen. This is why the battery needs to be mounted in an acid-resistant box which is ventilated to the exterior of the caravan. Overcurrent protection devices (fuses, circuit breakers) must not be installed in the battery compartment (nor in the gas bottle locker). Older caravans may have the battery positioned on the floor in a cupboard or bed locker, without any sealed separation from the living area, which are less safe than modern sealed ones and a separate battery locker can be installed to improve them. For caravans built since 1998, European Standards require that the battery is secured in a separate compartment. The battery must be securely held in place by clamps, and located well away from LPG cylinders, as a spark during connection or disconnection could ignite any gas which has leaked from them. The mandatory road lights (rear, stop, turn indicators, etc) are powered from the towing vehicle via a 7-pin '12N' plug and socket or a 13-pin plug and socket. Reversing lights, which are not currently mandatory, but are invariably fitted on all modern caravans are powered via a 7-pin '12S' plug and socket or the same 13-pin plug and socket. Several variants of this system have been used over time - make sure you know which system your caravan uses, and that your car is wired in a compatible way. Many road lighting circuit faults are often due to poor joints in the "earth return" connections. If the lights misbehave, for example if the intensity of other lights varies as the direction indicators operate, check all the earth return connections first. Include pin 3 of the 12N or 13-pin plug. 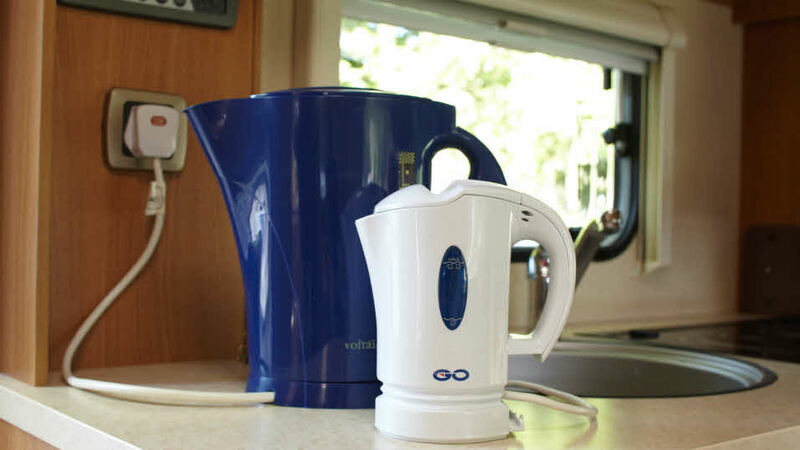 In older caravans, wires carrying lighting currents to the rear of the caravan often run beneath the floor, where there is an increased risk of damage and general wear and tear. If a wire is damaged, or open-circuited, replace the cable with one of a similar, or better, specification. Replace damaged lamps with a like-for-like unit. If this is not possible ensure that the new unit complies with the legal requirements for vehicle lighting. Note that rear lights must generally form a matched pair. Wiring should not be run through a compartment containing gas cylinders unless absolutely unavoidable. If such a run is necessary, the cable must be enclosed in a continuous gas-tight conduit or duct, capable of resisting impact. The cable must be positioned at least 500mm above the base of the gas cylinders. Wiring should be protected from physical damage by the use of plastic conduit or trunking. They should be positioned so that damage by the impact of sharp objects, e.g. the edges of awning poles, cannot occur. Fuses and/or miniature circuit breakers must be used in each circuit to provide protection against overload or short circuit. The rating of the fuse or circuit breaker must not be more than the maximum permissible current rating of the cable used in the circuit and all fuses must be enclosed to prevent accidental damage.